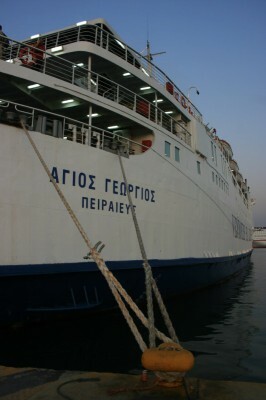 The Nikolaos, still with a red hull, at Perama in September 2009. After many years laid up at Elefsis and Salamis the first of the Sunderland-built Superflexes, the Superflex Alfa, saw service in 2008 as the Nikolaos between Igoumenitsa and Corfu for Ionion Lines, still with her original red hull. There she operated in competition with her former sister, the much rebuilt Pantokrator (Superflex Foxtrot). The operation did not seem to have been a success and for nine months the ship was laid up in Igoumenitsa. 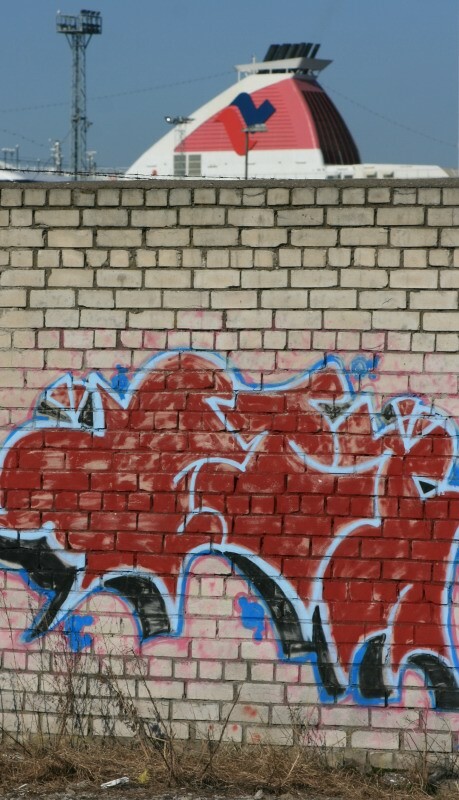 In July last year she moved to Perama for attention; however, there she remained, with work seemingly halted. The reports now are that it has been completed and the company’s website offers a glimpse of the new look – the red hull is gone and some new openings on the upper vehicle deck indicate that the changes are more than superficial. With her sister the Gitte 3 (ex-Superflex Delta) having recently departed for the scrappers, time is starting to catch up with this class of ship, most of which have experienced uncertainty and lay up at one stage or another through their fairly troubled history. Hopefully, the lead ship will be able to make a success of her operation this time around. The stylish Swedish train ferries Trelleborg (1958) and SkÃ¥ne (1967) were built for the Trelleborg-Sassnitz service, operated in co-operation with the East German Deutsche Reichsbahn, whose ships were rather more austere. The sad wreck of the Jassim (ex-Kattegat of 1961) is picked up quite clearly on Google Maps. Rather more haunting is the wreck of the Salem Express, the former Fred Scamaroni and Nuits Saint Georges which sailed direct from layup following her aborted UK service to trade in the Red Sea in 1981. The ship tragically sank in December 1991, taking at least 470 people with her. A deep breath is required before viewing some of these 2005 images of her interior, and of the remains of some of her doomed passengers. The Express Adonis (ex-Ailsa Princess/Earl Harold) rather disappeared off the radar when sold by Hellenic Seaways back in 2006. She has, however, embarked on a new career as a casino ship in Indian waters, firstly under the name New Caribbean Princess and most recently as the New Cambay Prince. Passengers appear to frequently arrive at the ship via tender which provides a few interesting youtube videos. Her operator’s website seems adequate enough but some of the reviews have been less flattering: how’s about “Thatâ€™s not to suggest that youâ€™re taking a ride in a rat-infested boat (or perhaps the rats have already jumped ship)” for a back handed compliment? Meanwhile, the headline ‘Disgusting!’ sums up environmentalists’ concerns about the ship’s alledged dumping of garbage in the Arabian Sea. The cutaway diagram is a staple for ferry operators trying to showcase their newest and best vessels to the discerning public. Most modern versions are fairly sanitised, but let’s look back to the early 1980s and Trasmed’s image of the Ciudad de Badajoz. Zoom in up-close and check out the detail of what the people on board are actually up to. Towelling themselves off after showers, stuck on lifts between floors, but mostly peacock-like showing themselves off to best advantage. And, just to the right of the lift, what is that man doing in the washbasin? Barely a month seems to go by without a current or former Superfast ship changing hands. This picture of the Superfast IX (now Atlantic Vision) in dry dock seems to fit the mood as the Attica fleet seems set into decline – just a sliver of red remains, the vast bulk being extinguished by a sea of blue. The days when Superfast changed overnight and then dominated the Greek international ferry market seem ever more distant. 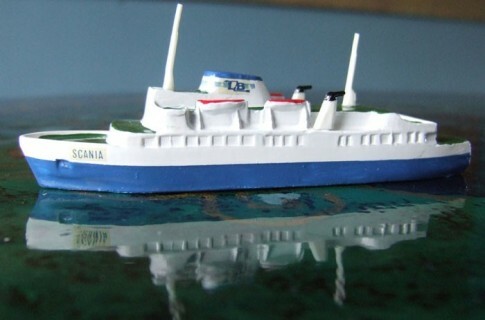 Pilot’s model ships have quite a following with examples passing for not inconsiderable sums on eBay. This website showcasing Bruce Peter’s collection snuck onto the web, unheralded, a couple of years ago. The Nereus was a smart little ship, built as the Scania for Rederi Ab Svea she was later the Scania Express and Polhelm before passing to Agapitos Lines in 1981. In Greece she was deployed on an almost incomprehensible schedule involving 30+ ports, mostly smaller islands with tiny populations. She was lost off the coast of Crete in 1989 and for many years the wreck was visible off Sideros. A couple of rather charming videos of the ship during her Greek career can be found here and here. Stena Line’s predilection for tinkering with their ships’ interiors shows no sign of abating. Here are some images of the most recent remodelling of the Kiel ships ‘Germanica’ and ‘Scandinavica’. In the last ‘Things Seen’ we touched on one of the Baroness M (ex-Lion)’s more dramatic moments when she was attacked by Syrian gunboats in 1990. 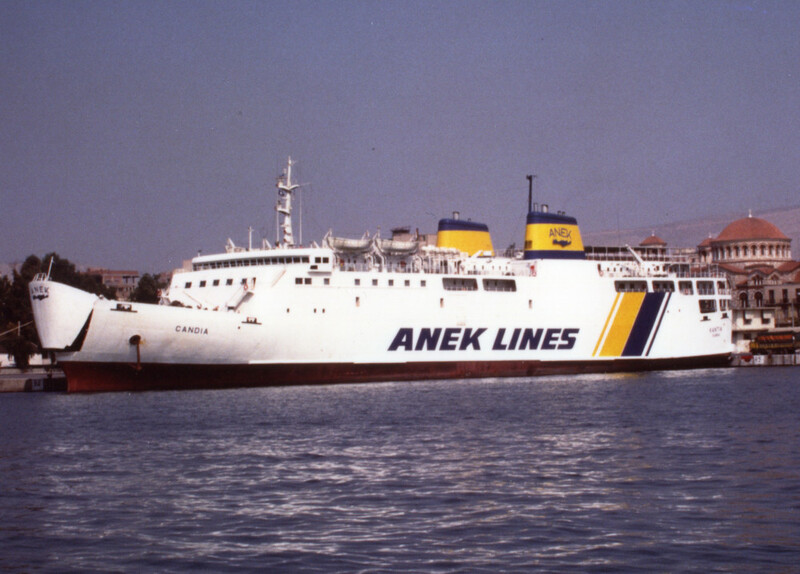 For sixteen years after being delivered in late 1967 until sale to the Greek Cypriot Marlines the ship was a familiar sight around the coast of the United Kingdom, and she was once more when chartered for a much commented-upon spell back on the English Channel for British Channel Island Ferries in 1987. In between times however the ship spent one Summer operating for Marlines on a long, once weekly, Ancona-Igoumenitsa-Patras-Izmir routing, via the Corinth Canal and it is during that 1986 season that she is captured here and here looking quite splendid as she passes through the canal with what appears to be only a modest sprinkling of passengers aboard. 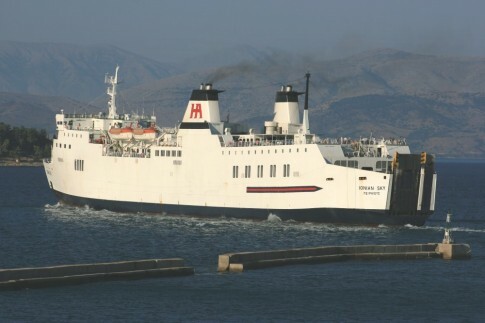 For years I paid little attention to the Candia and Rethimnon of ANEK, dismissing them as just another pair of Japanese ferries diverting attention from the real Greek beauties, the ex-North European tonnage. That rather narrow view of Greek ferry history still pertains to a degree, but what mustn’t be overlooked is the impact these ships had when introduced – they were virtually brand new and were an amazing contrast on routes to Crete to Minoan’s famed Minos and the Kydon, ANEK’s own original ship. Here, dignatories are shown around the Candia as she is inaugurated in 1973. Comedy capers with a current ANEK ship as this video of the Prevelis demonstrates that the so-called ‘Mediterranean moor’ isn’t as easily executed as it sometimes appears. The remains of the former Sealink Isle of Wight ferry Freshwater continue to languish at the former scrapyard in Garston, Merseyside to which she was sold back in 1996. This fascinating video tour of the ship just before she left Sealink service is a reminder of rather happier times. Lastly, as the ships head towards their 38th birthdays, here is a nice image of the Hengist and Horsa together off Folkestone very early in their English Channel careers. For the record, the Agios Georgios (ex-Hengist) had a hiccup with an engine failure a couple of days ago, returning to Piraeus to discharge her passengers. She has since resumed her regular services. The Agios Georgios at Piraeus. The Istra (ex-Mette Mols) at Split. Firstly, apologies to regular readers for the month or so of no updates – hopefully the break will have been worth it, with plenty of new material gathered during a 3 week trip to Southern Europe where plenty of ferries were seen, sailed on, photographed, and, in the case of at least three, farewells made as they are understood to be in the final weeks of service. The Istra (ex-Mette Mols, 1966) has since been put up for public sale by Jadrolinija, although the expectation is that she will follow former fleetmate the Ivan Zajc to Turkish owners. As Slobodna Dalmacija ruefully notes, there will be some criticism of the sale, as the ship “had its admirers, especially among Lastovo and KorÄula [residents], who praised its comfort” compared to the more modern vessels. 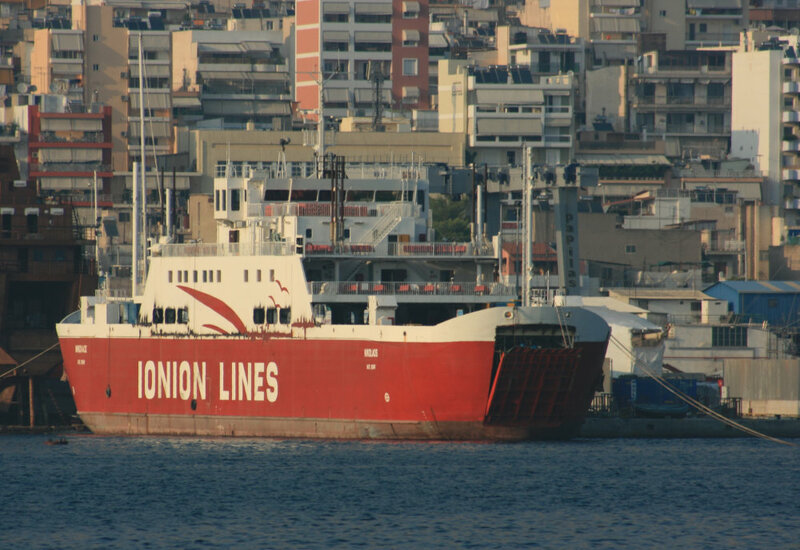 The ship has also been widely used to cover longer lines, such as for example the during the recent mechanical failure of the Petar HektoroviÄ‡. She was however proving too small at times, and when I sailed on her in late August she was forced to leave cars behind in Stari Grad. Doubtless this is frustrating when the next sailing back to Split isn’t for another four hours! 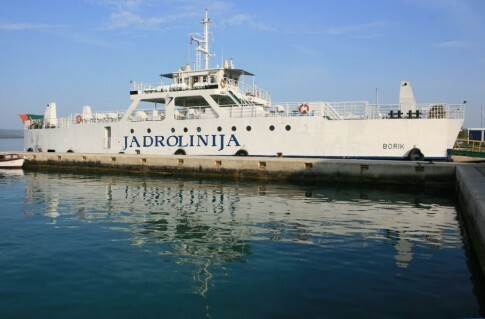 Also for sale are the Vanga (ex-Basto III) and the little Borik, latterly second ship to the Kijevo at Biograd. There remain several other Jadrolinija ships laid up in various ports around the country and Hans de Graaf continues to do a public service with his photographs of several of the many and varied ships of the White Fleet, a few more having been uploaded in recent weeks here. Meanwhile Fleet File Rotterdam has a fairly thorough section on Jadrolinija, correct up to a couple of years ago. The Borik (1978) in Biograd. 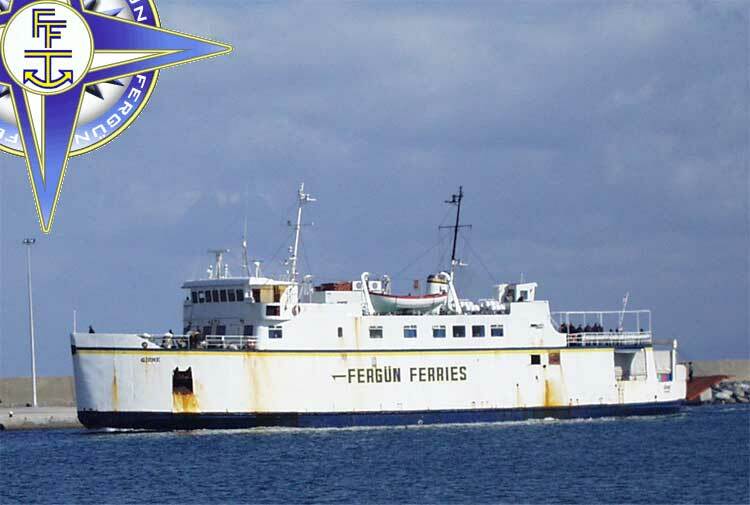 FergÃ¼n Shipping of Turkey operate a fleet of mostly-forgotten ex-North European ships on routes between Northern Cyprus and the Turkish mainland. Quite what current operations are like is open to question, the company’s website being more than a little out of date: at least two of the ships featured have been sold, one most definitely for scrapping having been seen on the beach in Aliaga in 2007. Emeraude Express (built for Emeraude in 1986 she survives without change of name). Canbulat Pasha. Purpose built, 1997. Girne. The ex-Saltholm (1967) of Svenska Rederi Ab Ã–resund’s Limhamn – DragÃ¶r route until 1979, then the Gozo Channel company’s Mgarr until sale to FergÃ¼n in 1996. 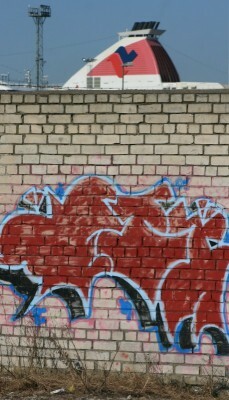 Scrapped 2007. Fatih. An astonishing survivor, originally being the Mersey pilot vessel Arnet Robinson (1958), passing to FergÃ¼n in 1988 where she was converted to a small car ferry. Compare this picture of her in her original guise with this image after conversion. Another picture of her as Fatih reveals the tall funnel remains unobstructed. GÃ¼niz. Built as the KraakerÃ¸ in Norway in 1964 she had an itinerant early career before settling down as Rederi AB Gotland’s Polhelm between 1964 and 1972. Later one of Tourship’s first vessels, the Corsica Ferry until sale in 1976 to Jadrolinija as the Lastovo I. 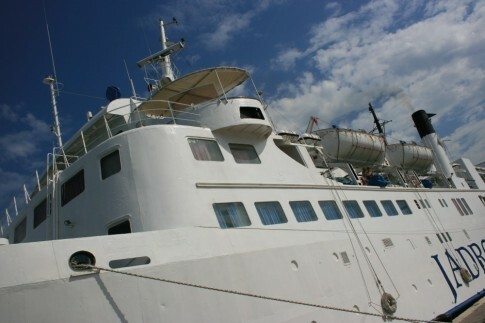 She remained, with a couple of name changes, with Jadrolinija until 1996 and has sailed in Turkish waters ever since, latterly for FergÃ¼n although she was sold in early 2009 to operate between Turkey and Russia. 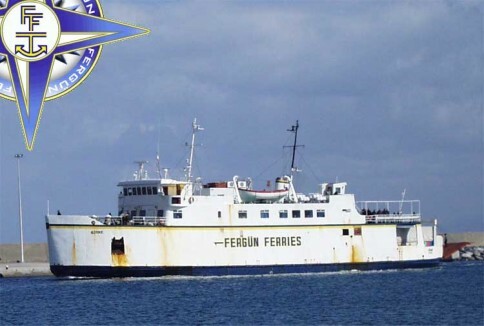 Some interesting images of Turkish/Russian ferries can be seen on the four pages of this link to a Russian shipping forum including the aforementioned GÃ¼niz and Ivan Zajc (now the Besyildiz), but also the Lider Avrasya (once Sealink’s Ulidia), Lider Clipper (ex-Agios Spiridon), still bearing her HML name the Apollonia II (ex-TravemÃ¼nde, 1964), the Trabzon (ex-Panagia Tinou, sold by NEL Lines earlier this year) and the Erke (formerly Agapitos Express/Saronikos Ferries’ Express Danae), amongst others. The Zeus Palace has been an interesting stopgap on Minoan Lines’ Patras-Igoumenitsa-Venice route this Summer, following the sale of the Pasiphae Palace. The return of the former Prometheus has been rather underwhelming for many passengers – although she looks nice enough in these pictures by Dominik Wagner, in reality she has been just a little too small for the route. Dominik also has recent images on board Agoudimos’ Ionian Sky. She is essentially unchanged since her Strintzis rebuild as the Ionian Victory in 1998. We have lingered over the demise of the Kapetan Alexandros several times on this blog, and the guys over at Nautilia clearly felt the same way about the end of this veteran, getting on board the ship in Keratsini just before she sailed for scrap to take some final photographs, including a series in her quite antiquated bridge. Apropos of nothing, I was taken with this dramatic image of the Princess Kathleen of Canadian Pacific sinking in 1952. The ship, built in Glasgow in 1924, originally made Vancouver-Victoria-Seattle coastal sailings but was latterly employed on cruises up to Alaska, meeting her fate after running aground near Juneau. Many more pictures of this dramatic event, in which no lives were lost, can be found at Alaska’s Digital Archive. The Queen Elizabeth 2 may not technically have been a ferry, but she was certainly, as built, a beautiful example of the very best of 1960s British design. This was sadly diluted in later years to a slightly naff kind kitsch look. However, as Bruce Peter notes in the authoritative Britain’s Greatest Liner the ship had direct design influences over many cruise ships and ferries in the subsequent decade or more. Bruce also references the famous 1969 article in Shipping World and Shipbuilder which compared and contrasted the QE2 with the equally new and forward-looking Vortigern, produced by Swan Hunters in the same year. For anyone wondering just what influence it was the epoch-making Vortigern had on the QE2, some superb images of the latter ship, as built, can be found here. The Caesarea and Duke of Argyll were two of the last surviving ex-Sealink steam ships, and both had final days in Hong Kong, the ‘Argyll’ burning out there under the name Zenith in 1995. There are some fascinating images on flickr of both ships in those days, including the burnt and broken Zenith. Mention was made of the Ã„lvsborg Bridge last month and, with perfect timing, over on LandgÃ¥ngen there materialised a thread with pictures of various ferries sailing beneath, including the Prinsessan Birgitta in her one season operating for Stena in 1982 before starting her career as the St Nicholas for Sealink. Tallink certainly aren’t my, or many other people’s, favourite ferry company at times, some superb ships such as the Star notwithstanding. The crassness of the company’s management is a primary reason for distaste, the famous incident on the Silja Symphony being the confirmation of previous suspicions about the company. The quote from one of the Tallink directors, “our level of drunkenness was normal for a cruise of this kind” was memorable, but the signature indiscretion of that fateful cruise was the attempt to “grill” some fish from the SmÃ¶rgÃ¥sbord in the toasters, conventionally used for bread. On my most recent trip on the ‘Symphony’ I made sure to have my picture taken next to one of the toasters; however, I wish I had known that there were even better permanent reminders of the event. Now: how does one get onto Tallink’s Christmas card list?